This is one of my regular disclosure posts. You can read more of them here. This one is about Tech Field Day 18. My flights to and from Austin, TX were on Qantas and paid for by Tech Field Day. I used frequent flyer points to upgrade to Premium Economy for the return flight from LAX to MEL. PivotNine paid for transport to and from MEL airport and my home, and for incidental expenses. I stayed at the Hilton Austin Airport, otherwise known as The Roundagon. 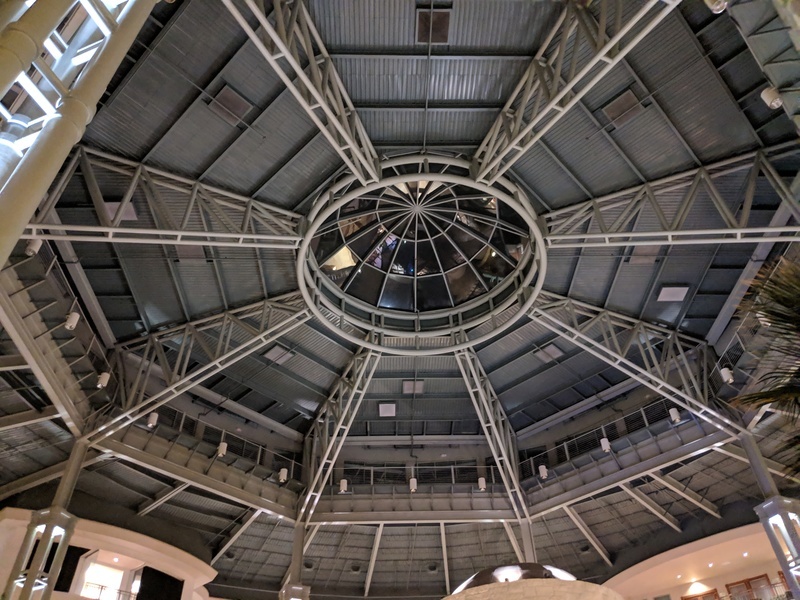 The roof of the Roundagon, aka the Hilton Austin Airport hotel. Breakfast was at the Qantas First lounge at Melbourne international airport. I had my usual poached eggs with mushrooms, spinach, and smoked salmon, and a coffee. I had the usual airplane meals, and then second breakfast at the Qantas First lounge at LAX international after a much needed shower. Poached eggs with hash brown, mushrooms, spinach and bacon, and a coffee. I nibbled on gummy bears and a couple of choc-chip cookies while doing work in the lounge as I waited for my next flight around midday. I landed in Austin and quickly dropped my stuff off in my hotel room before joining the rest of the Tech Field Day folks for dinner in a private room at the hotel. We snacked on Arnott’s Australia Shapes (technically Vegemite and Cheese Shapes, but they’re shaped like a map of Australia, so I call them Australia Shapes) that I had brought with me, and a selection of quesadillas and chips and salsa for the table. I had a Shiner Bock beer which was nicely refreshing after a long travel day. For starter I had a Caesar salad, and for main I went with a New York strip steak and a side of fries. We had some local Cabernet and Merlot wine for the table, but I had them in the wrong order and started with a glass of Merlot before having the Cabernet because I hadn’t realised there were two different kinds of red wine available. Breakfast was the hotel buffet; I had scrambled eggs and a spicy salsa and a couple of sausage links, though I didn’t need much after the large meal the night before. I bought a coffee from the room down with me. Lunch was in the hotel restaurant while discussing a writing project with GestaltIT and a client. I had a club sandwich and a glass of water. Dinner was at the Alamo Drafthouse cinema in downtown Austin while we watched The Big Lebowski. I had spicy mac-and-cheese and an ‘omnivore’ pizza, and a couple of local Fireman’s Blonde Ales to wash it down. Breakfast was coffee from my room and the same buffet eggs and sausage with spicy salsa as yesterday. For lunch we had Texas barbecue from La Barbecue courtesy of SolarWinds, at their offices. I had a bit of everything: sausage, brisket, turkey breast, beans, and a couple of different sauce things, accompanied by a diet Dr Pepper. 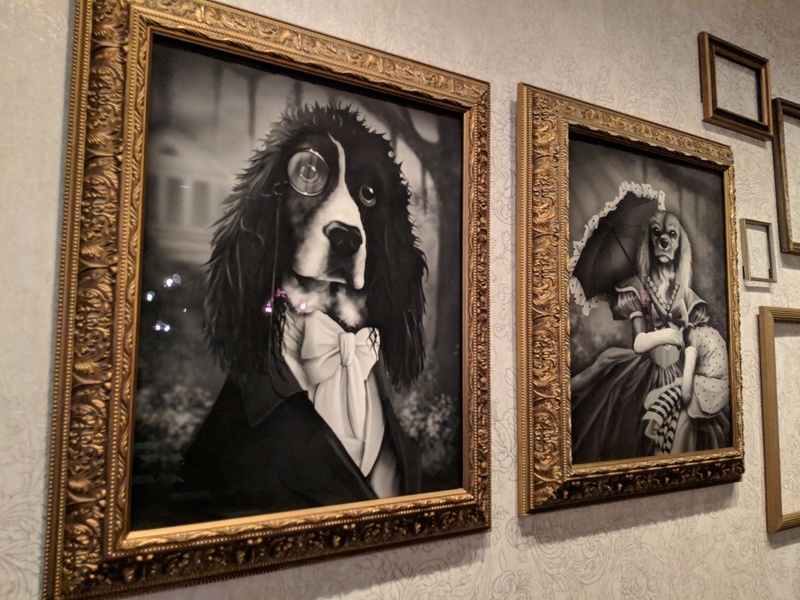 Fancy artwork at Fixe Southern House, Austin, TX. Dinner was at a fancy place in downtown Austin called Fixe Southern House, which serves US Southern cuisine. We had a selection of things for the table, and I tried the Fixe Biscuits which were surprisingly light and fluffy for what is basically a scone. The grilled shrimp were excellent, as was the pickled beets. I also had a serve of Shrimp and Smoked Oyster Gumbo which was tasty, though not quite as good as the amazing gumbo I had when in New Orleans a couple of years ago. For main I had the ‘Blackened’ Red Snapper, which was very nice. I had a couple of Old Fashioned cocktails with dinner, made with Woodford’s Reserve bourbon. They were quite good, though the best ones remain those at the main bar in the RW Marriott in Austin, TX. After we got back from dinner, PivotNine paid for a couple of rounds of drinks for the delegates and TFD crew at the hotel bar. I had a couple of glasses of Glenlivet 12. Breakfast was coffee from the in-room coffee maker and some nut bars and similar snacks that we’d received for Tech Field Day that I hadn’t eaten. Lunch was in the American Airlines lounge at Austin airport. They had a fairly decent bean/chili thing and their usual chips and cheese and olive nibble things. I grazed on those and had a bottle of water while I waited for my flight. During the flight from Austin to LAX I was surprised to get a complementary snack meal thing, I suppose due to my airline network status. I chose a cheese and fruit plate, and a ginger ale. Dinner was at the Qantas First lounge at LAX. I had a grilled prawn salad thing and the salt and pepper squid and a glass of Ladies Who Shoot Their Lunch chardonnay. Then it was a timezone shifted second dinner on the flight and breakfast of scrambled eggs in the morning just before we landed. A SolarWinds branded PARAMETER speaker. It’s encased in a kind of blonde wood and has Bluetooth and a 2.5mm input jack which is quite retro, as well as something called a TF card slot which I have just learned is a TransFlash card, which is like a microSD card. A VMware branded “It all starts with VMware vSphere” t-shirt. A Not For Resale license for VMware Workstation 15 Pro, and one for VMware Fusion 11 Pro. An “It all starts with VMware vSphere” branded travel mug. A VMware VSAN branded insulated bottle.